This entry was posted on January 22, 2019 by MidMeds. Terms & Conditions apply. 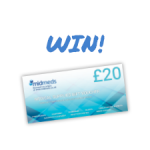 To be entered into the draw for a chance to win a £20 MidMeds voucher, you must complete the survey by 31st January 2019. Voucher cannot be spent on pharmaceutical items. Voucher will have an expiry of at least 6 months. MidMeds reserves the right to withdraw or alter this competition at any time and for any reason.